Julie Made This: Hello and ... Socks! Last night I found out that this little blog of mine has more readers than I thought it did, with quite a few ladies at the Wednesday's Coventry Knit-Wits get together admitting to dropping by. We also had a new lady come along, who said she'd recognised me from my profile picture. So to any unknown readers out there and my friends from the knitting group - hello! The humungous doily continues apace and I'm now slowly working may way around row 51 of 60. When I say slowly, I'm hoping I might get this round done by the time I go to bed tomorrow night, which will have meant it's taken me about four nights to complete one round. That's the problem with this kind of project, it starts off really fast but as the project gets bigger progress slows down to a crawl. The other problem is that I find crochet far harder on the hands and wrists than knitting. In particular, the left hand (which tensions the yarn and holds the project) is prone to stiffening up, while the right hand (doing the actual hooking) just aches after a while. I'm currently trying out a Clover Soft Touch crochet hook, courtesy of Jane and I've got to admit has helped quite a bit, even with the left hand which took me by surprise. I can only assume that less pain in the right hand means I'm not so tense and hence don't hold my left hand in a death grip. Jane (who is ever industrious) will be requiring her hook back and so I'm looking to get hold of one of my own, but the smaller sizes of the Clover hooks seem to be harder to source. Get Knitted have them, but on the off chance I emailed the Knitting and Crochet Guild to see if they had them, but hadn't updated their website. I had a promptish reply from the lady who deals with the KCGTrading side of things who said she'd order them in for me! Kudos to the Guild for customer service and me I guess for trying to support them (being a member and all). I'll have to wait until the hooks come in before I can place an order, but Jane has kindly allowed me to continue using her hook for another week, so all is good. No new photographs because I don't think the doily looks significantly different to the last one I took. I do however have a finished project! 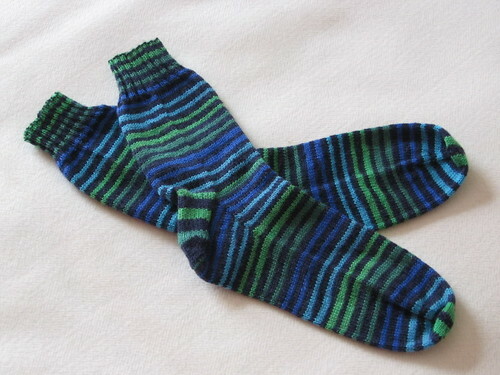 If you cast your mind back to July, you might remember that I started a pair of blue and green stripey socks, currently known as the Ork Deathskull Socks. Well, they're finished! Not only are they finished, but I actually got the stripes to mostly match up, despite having a yarn crisis and only just having enough to finish the pair. Personally I'm putting the problems down to the long colour repeats on the stripes. I started the first pair at the start of a 'green' phase, while the second ball started at the beginning of a blue phase. This meant I had to wind off all the blue to get to the next green starting point, and unfortunately this meant I ran out of yarn as I approached the toe! There was a serious 'Eeek' moment there as I like socks to match and I feared Dave may end up with one green toe and one blue one. Not a serious disaster and I'm sure he'd have loved them anyway, but it would have grated with me every single time I washed them. Fortunately, I had enough green left over from the first ball (just and I do mean, just) and was able to finish the second sock more or less in step with the first. 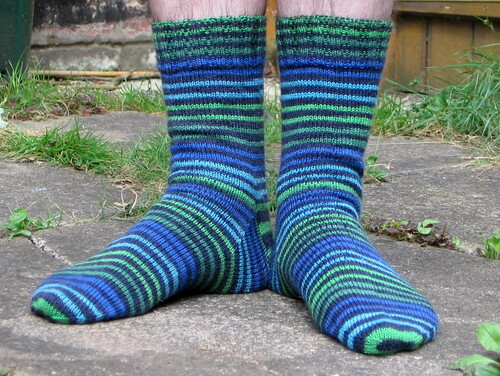 I give you Dave's Ork Deathskull Socks, in his favourite shades of blue and green. This is a simple, plain sock knit to the guidelines suggested by the Yarn Harlot in her excellent Knitting Rules!. It's knit on 2.5mm needles to a tension of 7 stitches per inch - note my usual mix of imperial and metric in the same sentence. The yarn is Regia's 'Mini Ringel Color' in colourway 5220, which knits up pretty much as you see. And finally, because I rarely get to include a decent picture of Charlie as he normally comes out over exposed or blurry or is under (i.e. in) a bush, another pic of him sat under the lavender bush while Dave was modeling socks. Very nice socks, I love the colours of them. I had a similar surprise when I discovered my readership, most people don't leave a note of their passing although I like to get them. I think Ork Deathskull Socks is a strong brand name.